DDR3 SDRAM (the third generation of double data rate synchronous DRAM) was introduced way back in 2007. Carrie Underwood had scored her first Grammy. Russian leader Boris Yeltsin died. And Barry Bonds broke Hank Aaron’s home-run record. Now the PC industry is finally preparing to transition to DDR4 memory. Part of the reason for the long gestation period is that memory manufacturers compete more on price than performance. And unlike the CPU and GPU markets, where just two companies dominate the market, memory standards are developed by a committee: The Joint Electron Devices Engineering Council (JEDEC). If you want a standard to develop slowly, do it by committee (consider how long the IEEE is taking to ratify the 802.11ac Wi-Fi standard). 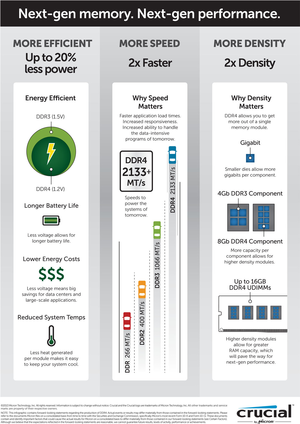 DDR4’s lower power requirements—and the corresponding reduction in waste heat—will be this technology's real draw. JEDEC, which consists of every memory maker in the world, started work on the DDR4 spec in 2005—two years before DDR3 even hit the market—but the first test samples didn’t appear until 2011. DDR4 memory finally hit the market last year in very limited supply, but the industry finally shifted into high gear around Computex 2014. What’s so great about DDR4? Read on and the truth shall be revealed. 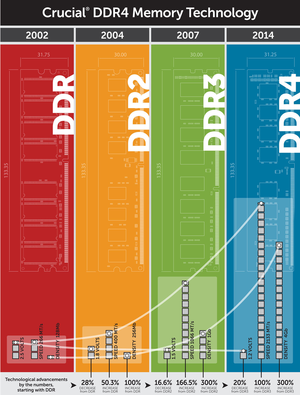 There are a lot of deeply technical aspects to DDR4, but we won’t dive that far. The two key improvements in DDR4 are power consumption and data transfer speed, thanks to the development of an all-new bus. 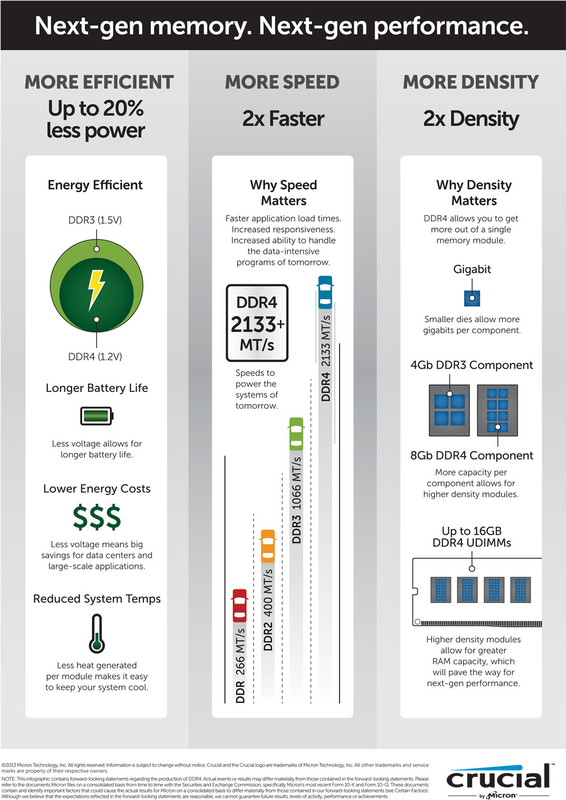 DDR4 memory will deliver significant benefits in terms of performance and power consumption. DDR3 generally requires 1.5 volts of electrical power to operate. DDR4 needs 20 percent less—just 1.2 volts. DDR4 also supports a new, deep power-down mode that will allow the host device to go into standby without needing to refresh its memory. Deep power-down mode is expected to reduce standby power consumption by 40- to 50 percent. Less power draw means less heat and longer battery life, so laptops and servers are expected to be the biggest beneficiaries of the jump to DDR4. Servers can be deployed with as much as a terabyte of memory and they routinely operate 24/7, so the power bills to keep them running—along with the onboard fans and outboard ventilation systems to keep them cool—can be enormous. Mid-range and high-end laptops routinely ship with 8GB of memory, so the 20-percent reduction in power consumption is more important for extending battery life than reducing utility bills. The LCD panel remains the biggest power draw, and the CPU eats its share of juice, but every little bit helps. Smartphones and tablets will benefit from DDR4 memory, too. Because they typically come with only 1GB or 2GB of memory—and their displays consume much more power than their memory—they'll benefit much like laptops will, from extended battery life rather than lower power bills. But that hasn’t stopped Qualcomm from getting into the game. Its Snapdragon 810 mobile processor uses low-power DDR4 memory, and devices using this chip are expected to ship in the first half of 2015. 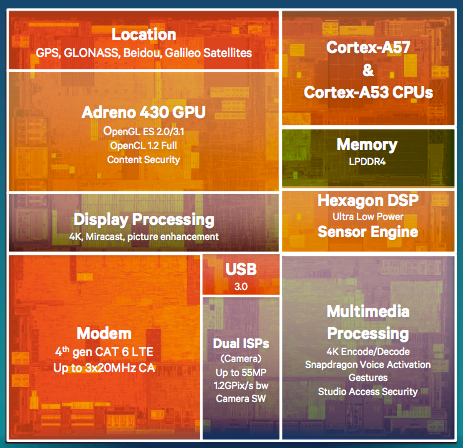 Qualcomm's new Snapdragon 810 processor will take advantage of DDR4 memory. Reducing power consumption will give desktop PC users a warm, green feeling, but they’ll probably appreciate DDR4’s speed bump a lot more. DDR4 memory kits shown off at Computex boasted speeds ranging from 2133MHz to 3200MHz, and DDR4 could eventually hit 4266 MHz. DDR3 memory topped out at 2133 MHz, so there’s no question memory will be a lot faster. Finally, DDR4 uses much higher-density chips, so each memory stick (DIMM, technically) will pack a lot more memory. Where you might buy DDR3 memory in 1- or 2GB kits for desktops and notebooks, expect to see 4- and 8GB kits with DDR4. 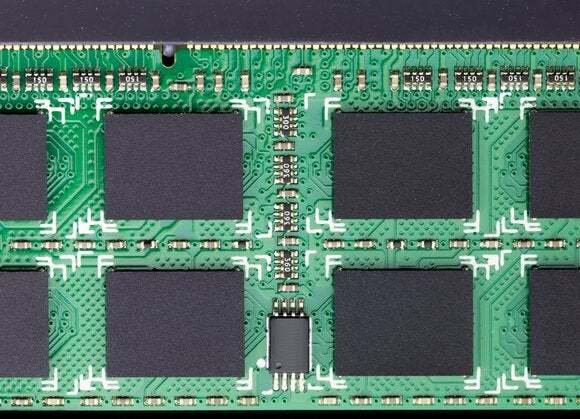 And for high-end servers, each DDR4 DIMM could deliver 64- or even 128GB of memory. Do you need DDR4 memory? Will you ever? Before you get too excited about DDR4, note that it hasn’t even reached bleeding edge status. You can’t buy DDR4 memory today, and your existing hardware wouldn’t be able to use it if you could. But it’s a safe bet that it will be expensive when it does come to market. Mike Howard, memory analyst at the research firm IHS, said he expects DDR4 memory to launch later this year at prices 40- to 50 percent higher than DDR3 memory. So if you were to buy 16GB of DDR3 memory at the average price of $140, the same amount of DDR4 memory would set you back around $210. Improvements in memory technology occur at a relatively stately pace. According to Reeves, DDR4’s lower power requirements—and the corresponding reduction in waste heat—will be this technology's real draw. “Memory has become so much more reliable in recent years with the voltage drops from 2.1- to 1.8- to now 1.5 volts,” he said. An investment in DDR4 will also entail a motherboard upgrade, because you’ll need a new chipset. Intel’s upcoming X99 chipset will support DDR4 memory, along with a new Extreme Edition of its Haswell CPU (codenamed Haswell-E). And it’s precisely that power-user segment that would consider paying $1000 for Intel’s best processor. If that doesn’t describe you, you don’t need to worry about jumping into a major upgrade anytime soon, or even postponing your next PC purchase until models with DDR4 come out. That’s not to say DDR4 will be a waste of money. It’s just that in its early days, it won’t deliver significant benefits to anyone beyond the earliest of adopters.